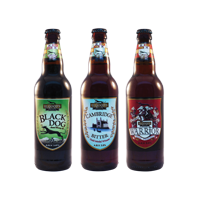 At Elgood’s online shop we offer a full range of our award winning bottled Ales. From traditional ales to our “Quintessentially English” range. Please click a bottle to find out more about the beer and it’s character or go straight ahead and add it to your shopping basket. You can add and change quantities in the shopping cart. Don’t forget, delivery is FREE! Why not pop in to our brewery shop? We offer a wide range of beers, merchandise and even a brewery discount compared to our online prices.